The above code was deleted in December 2010 commit. Unfortunately, there is almost no documentation in the source code, so there is no explanation regarding the lack of support for the idle function in these CPUs. Is there a specific hardware reason that Core 2 processors are not supported by intel_idle? Is there a more appropriate way to configure a kernel for optimal CPU idle support for this family of processors (aside from disabling support for intel_idle)? While researching Core 2 CPU power states ("C-states"), I actually managed to implement support for most of the legacy Intel Core/Core 2 processors. The complete implementation (Linux patch) with all of the background information is documented here. As I accumulated more information about these processors, it started to become apparent that the C-states supported in the Core 2 model(s) are far more complex than those in both earlier and later processors. These are known as Enhanced C-states (or "CxE"), which involve the package, individual cores and other components on the chipset (e.g., memory). At the time the intel_idle driver was released, the code was not particularly mature and several Core 2 processors had been released that had conflicting C-state support. ...the quad-core Intel Core 2 Extreme (Kentsfield) processor supports all five performance and power saving technologies — Enhanced Intel SpeedStep (EIST), Thermal Monitor 1 (TM1) and Thermal Monitor 2 (TM2), old On-Demand Clock Modulation (ODCM), as well as Enhanced C States (CxE). Compared to Intel Pentium 4 and Pentium D 600, 800, and 900 processors, which are characterized only by Enhanced Halt (C1) State, this function has been expanded in Intel Core 2 processors (as well as Intel Core Solo/Duo processors) for all possible idle states of a processor, including Stop Grant (C2), Deep Sleep (C3), and Deeper Sleep (C4). A core C-state is a hardware C-state. There are several core idle states, e.g. CC1 and CC3. As we know, a modern state of the art processor has multiple cores, such as the recently released Core Duo T5000/T7000 mobile processors, known as Penryn in some circles. What we used to think of as a CPU / processor, actually has multiple general purpose CPUs in side of it. The Intel Core Duo has 2 cores in the processor chip. The Intel Core-2 Quad has 4 such cores per processor chip. Each of these cores has its own idle state. This makes sense as one core might be idle while another is hard at work on a thread. So a core C-state is the idle state of one of those cores. This EXPERIMENTAL driver supersedes acpi_idle on Intel Atom Processors, Intel Core i3/i5/i7 Processors and associated Intel Xeon processors. It does not support the Intel Core2 processor or earlier. The above presentation does indicate that the intel_idle driver is an implementation of the "menu" CPU governor, which has an impact on Linux kernel configuration (i.e., CONFIG_CPU_IDLE_GOV_LADDER vs. CONFIG_CPU_IDLE_GOV_MENU). The differences between the ladder and menu governors are succinctly described in this answer. Modes C1 to C3 work by basically cutting clock signals used inside the CPU, while modes C4 to C6 work by reducing the CPU voltage. "Enhanced" modes can do both at the same time. From this table (which I later found to be incorrect in some cases), it appears that there were a variety of differences in C-state support with the Core 2 processors (Note that nearly all Core 2 processors are Socket LGA775, except for Core 2 Solo SU3500, which is Socket BGA956 and Merom/Penryn processors. "Intel Core" Solo/Duo processors are one of Socket PBGA479 or PPGA478). Intel’s Core 2 Duo E8500 supports C-states C2 and C4, while the Core 2 Extreme QX9650 does not. Interestingly, the QX9650 is a Yorkfield processor (Intel family 6, model 23, stepping 6). For reference, my Q9550S is Intel family 6, model 23 (0x17), stepping 10, which supposedly supports C-state C4 (confirmed through experimentation). Additionally, the Core 2 Solo U3500 has an identical CPUID (family, model, stepping) to the Q9550S but is available in a non-LGA775 socket, which confounds interpretation of the above table. 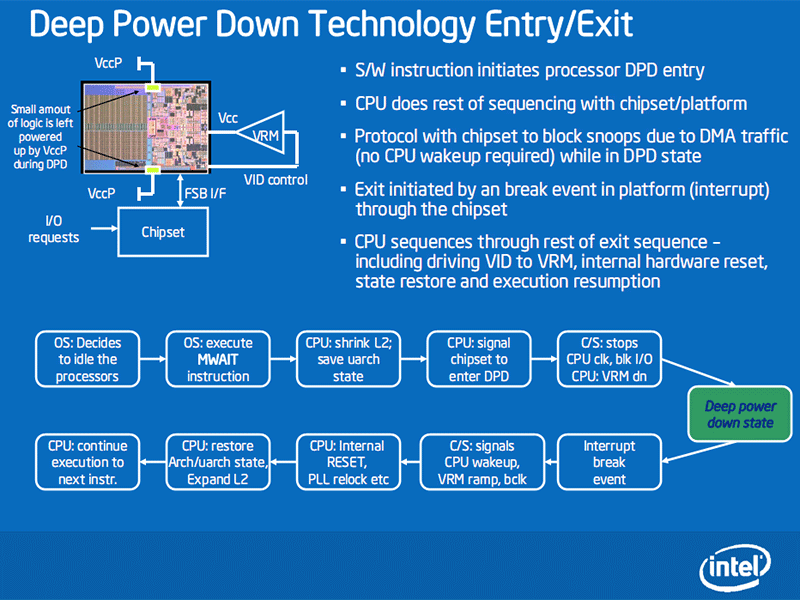 Clearly, the CPUID must be used at least down to the stepping in order to identify C-state support for this model of processor, and in some cases that may be insufficient (undetermined at this time). From the above, we have Intel Family 6, Model 23 (0x17) defined as INTEL_FAM6_CORE2_PENRYN. This should be sufficient for defining idle states for most of the Model 23 processors, but could potentially cause issues with QX9650 as noted above. So, minimally, each group of processors that has a distinct C-state set would need to be defined in this list. Bear in mind that is the ACPI C state, not the processor one, so ACPI C3 might be HW C6, etc. Beyond the processor itself, since C4 is a synchronized effort between major silicon components in the platform, the Intel Q45 Express Chipset achieves a 28-percent power improvement. The chipset I'm using is indeed an Intel Q45 Express Chipset. The processor-specific C-states defined in MWAIT extensions can map to ACPI defined C-state types (C0, C1, C2, C3). The mapping relationship depends on the definition of a C-state by processor implementation and is exposed to OSPM by the BIOS using the ACPI defined _CST table. From the amount of diversity in C-state support within just the Core 2 line of processors, it appears that a lack of consistent support for C-states may have been the reason for not attempting to fully support them via the intel_idle driver. I would like to fully complete the above list for the entire Core 2 line. This is not really a satisfying answer, because it makes me wonder how much unnecessary power is used and excess heat has been (and still is) generated by not fully utilizing the robust power-saving MWAIT C-states on these processors. Package C-state (PC0-PC10) - When the compute domains, Core and Graphics (GPU) are idle, the processor has an opportunity for additional power savings at uncore and platform levels, for example, flushing the LLC and power-gating the memory controller and DRAM IO, and at some state, the whole processor can be turned off while its state is preserved on always-on power domain. I've finally accessed the Enhanced Core 2 C-states, and it looks like there is a measurable drop in power consumption - my meter on 8 nodes appears to be averaging at least 5% lower (with one node still running the old kernel), but I'll try swapping the kernels out again as a test. An interesting note regarding C4E support - My Yorktown Q9550S processor appears to support it (or some other sub-state of C4), as evidenced above! This confuses me, because the Intel datasheet on the Core 2 Q9000 processor (section 6.2) only mentions C-states Normal (C0), HALT (C1 = 0x00), Extended HALT (C1E = 0x01), Stop Grant (C2 = 0x10), Extended Stop Grant (C2E = 0x11), Sleep/Deep Sleep (C3 = 0x20) and Deeper Sleep (C4 = 0x30). What is this additional 0x31 state? If I enable state C2, then C4E is used instead of C4. If I disable state C2 (force state C2E) then C4 is used instead of C4E. I suspect this may have something to do with the MWAIT flags, but I haven't yet found documentation for this behavior. I believe that is to be interpreted as the C1E state is entered on other components (e.g. memory) only when all cores are in the C1E state. I also take this to apply equivalently to the C2/C2E and C4/C4E states (Although C4E is referred to as "C4E/C5" so I'm uncertain if C4E is a sub-state of C4 or if C5 is a sub-state of C4E. Testing seems to indicate C4/C4E is correct). I can force C2E to be used by commenting out the C2 state - however, this causes the C4 state to be used instead of C4E (more work may be required here). Hopefully there aren't any model 15 or model 23 processors that lack state C2E, because those processors would be limited to C1/C1E with the above code. Also, the flags, latency and residency values could probably stand to be fine-tuned, but just taking educated guesses based on the Nehalem idle values seems to work fine. More reading will be required to make any improvements. I tested this on a Core 2 Duo E2220 (Allendale), a Dual Core Pentium E5300 (Wolfdale), Core 2 Duo E7400, Core 2 Duo E8400 (Wolfdale), Core 2 Quad Q9550S (Yorkfield) and Core 2 Extreme QX9650, and I have found no issues beyond the afore-mentioned preference for state C2/C2E and C4/C4E. The original Core Solo/Core Duo (Yonah, non Core 2) are family 6, model 14. This is good because they supported the C4E/C5 (Enhanced Deep Sleep) C-states but not the C1E/C2E states and would need their own idle definition. Core 2 Solo SU3300/SU3500 (Penryn-L) are family 6, model 23 and will be detected by this driver. However, they are not Socket LGA775 so they may not support the C1E Enhanced Halt C-state. Likewise for the Core 2 Solo ULV U2100/U2200 (Merom-L). However, the intel_idle driver appears to choose the appropriate C1/C1E based on hardware support of the sub-states. Core 2 Extreme QX9650 (Yorkfield) reportedly does not support C-state C2 or C4. I have confirmed this by purchasing a used Optiplex 780 and QX9650 Extreme processor on eBay. The processor supports C-states C1 and C1E. With this driver modification, the CPU idles in state C1E instead of C1, so there is presumably some power savings. I expected to see C-state C3, but it is not present when using this driver so I may need to look into this further. In conclusion, it turns out that there was no real reason for the lack of Core 2 support in the intel_idle driver. It is clear now that the original stub code for "Core 2 Duo" only handled C-states C1 and C2, which would have been far less efficient than the acpi_idle function which also handles C-state C3. Once I knew where to look, implementing support was easy. The helpful comments and other answers were much appreciated, and if Amazon is listening, you know where to send the check. This update has been committed to github. I will e-mail a patch to the LKML soon. Update: I also managed to dig up a Socket T/LGA775 Allendale (Conroe) Core 2 Duo E2220, which is family 6, model 15, so I added support for that as well. This model lacks support for C-state C4, but supports C1/C1E and C2/C2E. This should also work for other Conroe-based chips (E4xxx/E6xxx) and possibly all Kentsfield and Merom (non Merom-L) processors. As sourcejedi’s answer says, the driver doesn’t exclude all of family 6. The intel_idle initialisation checks for CPUs in a list of CPU models, covering basically all micro-architectures from Nehalem to Kaby Lake. Yorkfield is older than that (and significantly different — Nehalem is very different from the architectures which came before it). The family 6 test only affects whether the error message is printed; its effect is only that the error message will only be displayed on Intel CPUs, not AMD CPUs (Intel family 6 includes all non-NetBurst Intel CPUs since the Pentium Pro). To answer your configuration question, you could completely disable intel_idle, but leaving it in is fine too (as long as you don’t mind the warning). You have ACPI enabled, and you've checked that acpi_idle is in use. I sincerely doubt you have missed any helpful kernel config option. You can always check powertop for possible suggestions, but probably you already knew that. This is not an answer, but I want to format it :-(. Looking at the kernel source code, the current intel_idle driver contains a test to specifically exclude Intel family 6 from the driver. The if statement does not exclude Family 6. Instead, the if statement provides a message when debugging is enabled, that this specific modern Intel CPU is not supported by intel_idle. In fact, my current i5-5300U CPU is Family 6 and it uses intel_idle. What excludes your CPU is that there is no match in the intel_idle_ids table. Not the answer you're looking for? Browse other questions tagged linux drivers cpu power-management intel or ask your own question. How to reduce temperature of my Toshiba with Slackware? Getting “Protocol not supported” from setkey: why? Kernel Configuration: Which Processor Family to choose for 'Celeron M CPU 420' (Core Solo)? Why are some caches not droppable? Linux - Why are my core IDs not consistent?